The internet's best spaghetti sauce recipes ! Welcome to my spaghetti sauce recipes site; come on in and make yourself at home; this site is designed to function intuitively, just like a good old italian Chef's messy cookbooks, you will find many areas with different italian sauce recipes for pasta that you can explore and decide which one you want to try... Take your time, browse through and try our delicious spaghetti recipes; Buon Appetito! This is one of the basic and simple spaghetti sauce recipes of this site... This recipe tastes great and it is easy to do, and is very open to customization! Please feel free to add vegetables, with nice and vivid colors such as zucchini, broccoli, peppers of all colors etc... Only be careful with vegetables as timing is always important; so that they don't get over- or undercooked. bring pan up to heat on medium setting. Stirring occasionaly to prevent sticking. Top with some grated cheese. prescribes not to eat meat. A delicious way to obey the rules! Serve over Spaghetti, linguine or your favorite italian pasta. In a sauce pan or skillet, pour 5 Tbls virgin olive oil, bring up to heat on a medium low setting. and half of a cup of water. Blend until it has a smooth, even texture. You can also add oregano or dried parsley to taste. how hot and spicy you want your pasta sauce to taste like. Serve over Spaghetti, linguini or your favorite pasta. In a sauce pan or skillet, pour 3 Tbls virgin olive oil, bring up to heat on a medium low setting. Incorporate then the tomatoes and half of a cup of water. Blend until it has a smooth, even texture. Add in the Parmesan cheese, stir until blended in the sauce. As everyone can see, spaghetti sauce recipe variations are limited only by the Chef's own imagination. This page summarizes most classic, preferred recipes. I noticed many of my visitors are from the United States, states like California and New York, among many others. So these pages were designed to cater to them. I have created these pages to inspire recreational cooking ideas and to educate; in a well organised straight to the point presentation. and unhelpful. As a surfer, in other recipe sites, you type what you are looking for in your favorite search engine, you then reach a website in which you will have to perform yet another search to find the recipe you are looking for. This makes no sense to me. looking for in the first place you land. 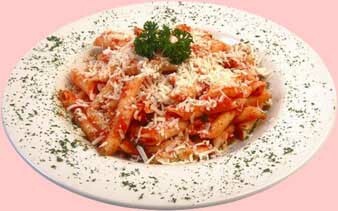 So, for more italian pasta recipes ideas, click that link! Hey, my advice to everyone: never forget to have fun, in everything you do!